Grade: Moderate.A few steepish slopes with a total of around 1000 feet of ascent, and after wet weather some muddy sections. 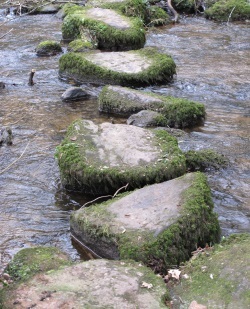 There are also sturdy stepping stones over the river. 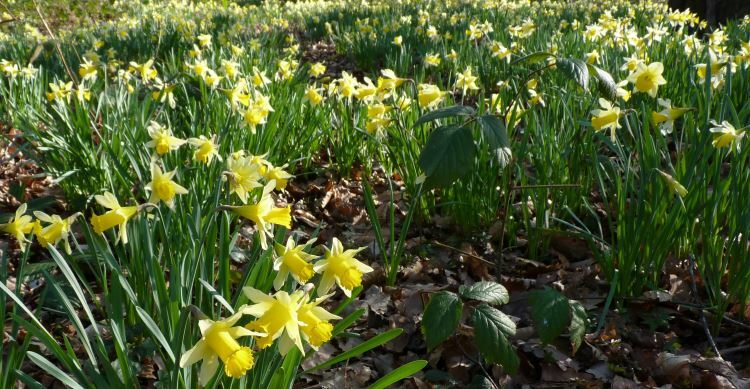 Key Features: At the right time of year – wild daffodils. 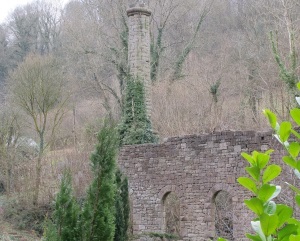 All the year round – the fascinating ruins left from a thriving industrial past. This was based on power from the rapidly running stream. Wire and then paper was produced, with effluent from the latter making the stream turn white. One use for the paper was making £5 notes – worth a lot in the 1800s! More in depth information is available here. If you’re coming from Chepstow go north up the A466, through Llandogo, until you get to a point where the road veers right over the the river and goes over the Bigsweir bridge. Instead of going over the bridge, you continue straight ahead towards Whitebrook. Go past the restaurant called the ‘Crown at Whitebrook’ on your left hand side. At the time of writing this has unfortunately closed down – depriving us of some superb (if expensive) food! 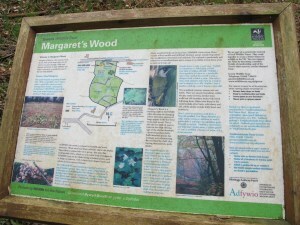 Around 50 yards further on your left Gwent Wildlife Trust looks after a small nature reserve called Saint Margaret’s wood. If you’re not planning on doing the walk but want to see some wild daffodils – this is a good place to do just that. Just past the reserve you get to a small building on your right, and directly opposite this on your left there is a public footpath sign, which marks the start of the walk. Climb over the stile and take a gentle diagonal to the right over what used to be an open area, but has recently had trees planted. Aim for the next stile which takes you into a wood, where you turn continue right diagonally uphill. When the path eventually reaches a small house, turn left along the track walking beside a pebble dashed bungalow. A few yards later you reach a tarmac road where you turn right. Continue along this road, past Rose farm on your left hand side, until you reach a metal bar gate on your left. Take the path just to the right of this gate. Go up the field, staying towards the left hand side. If you look back over your shoulder there are some good views of the Forest of Dean. Continue into woodland, following the yellow footpath signs. After a stile take the track ahead of you which bears slightly towards the right through conifer trees. When you get to a junction of footpaths continue straight on, until you reach a forest track with a gravel surface – where you turn right. After about 50 yards take the larger track which goes off to the left. After another hundred yards or so take the track off to the right. Continue along until a bridle path crosses over the track which you are on. Go to the right here on a path indicated by a ‘Tread and Trot’ sign with a blue arrow and green circle. Continue to follow these ‘Tread and Trot’ signs and when the path rejoins a larger forest trail carry on in your direction of travel. After about a hundred yards the ‘Tread and Trot’ trail goes straight ahead -leaving the main track again. Continue to follow the signs for this trail, over a road, and on until you get to the Whitebrook road where you turn left. After about 50 yards turn right over the stream. Pass the telephone box on your left, and after a few yards turn right following the sign to New Mills. Continue, going in front of the New Mill buildings, and straight on over a stile onto an old track. Continue, following the blue arrows. When we did this walk there had been some forest operations, but if you follow the path as best you can, towards the top of the hill it eventually joins on to a broad track, where you turn right. Continue along this forest track for about 1½ miles, until the track turns very sharply left. At this point the path you want goes off the track and continues straight on downhill. Towards the bottom of the path we came across drifts of wild daffodils in full bloom. At the bottom, just before the crossing over the stream, there is a signpost to Colonels Park – you take this route, following a green ‘Tread and Trot’ sign. On your left you will see many remnants of the industry in Whitebrook, most noticeably the chimney marking the remains of Clearwater paper mill. Go along this path for a mile or so, until on the left you see a yellow arrow (and also a small circular sign for Lower Wye Ramblers Walk 7)indicating a downward path. Follow this path down some steps to the stream which you cross on stepping stones. Go upwards for a short distance and over a stile to the asphalted road (opposite The Crown). Go right and this will take you back to the beginning of the walk. If you haven’t managed to find daffodils and haven’t yet been to the Saint Margaret’s wood nature reserve, you will pass it on your way back. We did this walk on Good Friday (29th March) 2013. We had had a very long winter, predominantly wet but with a bitter March which had delayed Spring. In the woods there were promising signs: tips of wild garlic leaves, celandine in bud. But apart from these it might just as well have been January. In an average year native wild daffodils can be expected to be in bloom in the lower Wye valley around mid March, so we decided to see if we could find any which had managed to open their faces to the sun on this Good Friday. We popped into Saint Margaret’s nature reserve before we started walking, since this is one place where large quantities of wild daffodils reliably appear (Margaret’s Wood). However, not a glimmer of gold could be seen, so we decided to embark on an Easter quest to see if we could find any wild daffodils in flower. In retrospect, beginning by climbing up to Trellech Common was not very sensible. There was still snow lying amongst the trees, and all prudent flowers were staying well below ground. 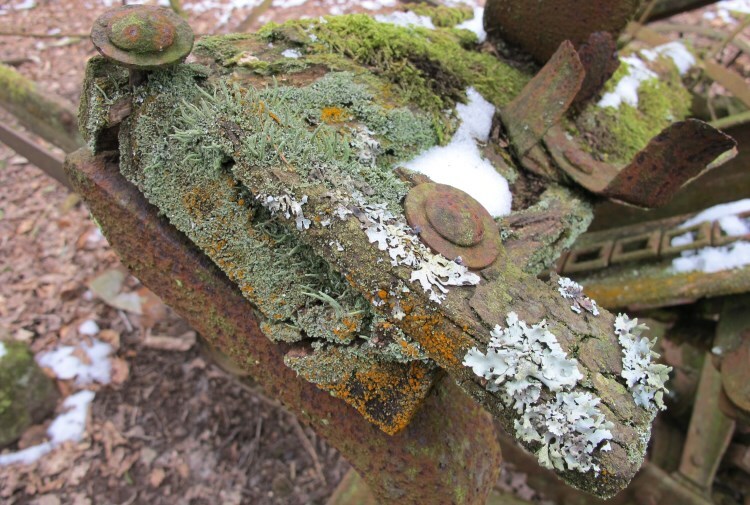 Towrds the top we came across the corpse of a piece of agricultural machinery, which was providing a haven for lichens of all colours – and the red rust and lichens were set against runnels of white snow. 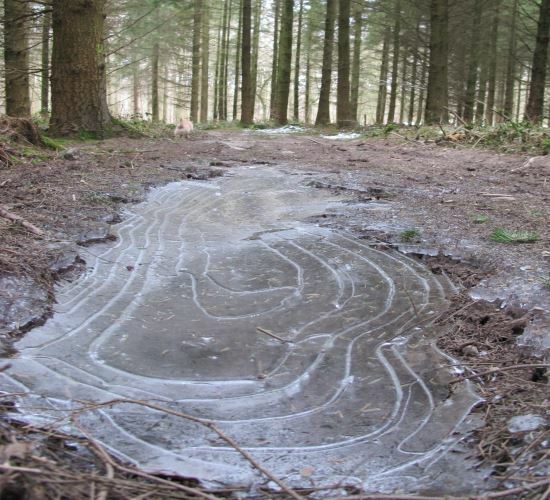 The puddles in the wood had frozen and re-frozen to make concentric patterns. Anyway – it was cold at the top. So, at this point we decided we should apply some logic to our quest, and decided to go down and across to the south facing slopes of the Whitebrook Valley. We really were getting very pessimistic, so were delighted when, as we were getting towards the lowest and southerly facing part of the walk we came across hundreds of little yellow faces smiling their delight that they had battled against winter and won.